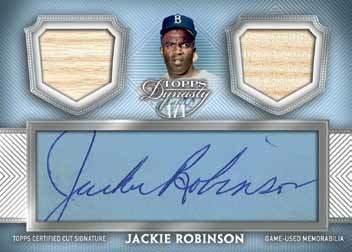 Greatly emphasizing quality over quantity, 2017 Topps Dynasty Baseball offers a lot despite only having one card in each hobby box. Just as in the 2016 release, all cards are signed and come in a protective case. The limited format also means that every card is numbered to 10 copies or less. 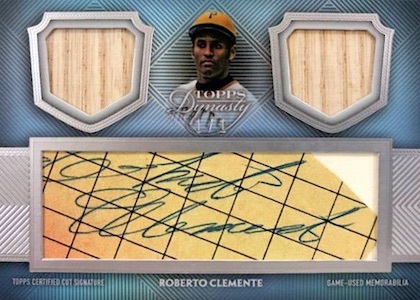 All things considered, the 2017 Topps Dynasty Baseball checklist is fairly simple in that every card is either an autographed relic or a cut signature. 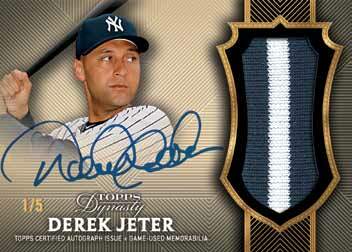 Sticking with a horizontal design, the primary option is found in the Dynasty Autograph Patch set. Limited to 10 copies, these also have low-numbered parallels (#/5 and 1/1, respectively). 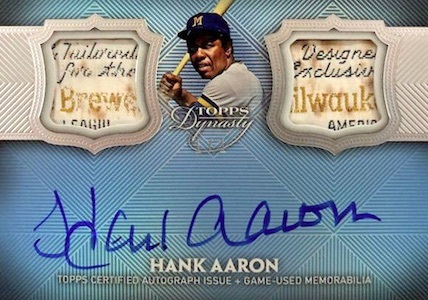 Incorporating more premium swatches, Dynasty "On This Day" Autograph Patch cards, numbered to five copies with a one-of-one parallel, feature an MLB Authentication hologram. There are also Dynasty Autographed MLB Silhouetted Batter Logo Patch cards, which debut as a one-of-one logoman chase. 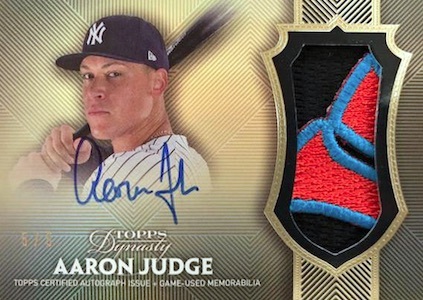 Going a step further, Dynasty Autographed Dual Relic cards have two relics and one signature, while new Dynasty Dual Autographed Patch cards display a pair of signatures and a swatch for each player. Both inserts are limited to five copies with an added one-of-one parallel. Reserved for the former greats, Dynasty Cut Signatures and Dynasty Dual Relic Cut Signatures each have just one copy per card. 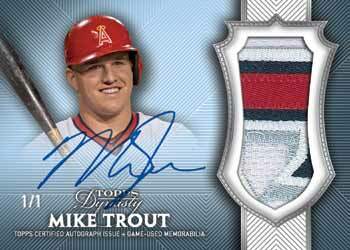 2017 Topps Dynasty Baseball Relic AUTO Mike Trout 5 10 ANGELS! 99 subjects. Some players have multiple versions. Serial numbered #/10. PARALLEL CARDS: Parallel #/5, Parallel 1/1. 99 cards. Serial numbered 1/1. Only 1,858 cards produced at $335 per, and mostly mediocre stars, once again. You need to be certified insane or insanely wealthy and bored out of your mind to fall for this. Already here we go with the “too expensive” quips and weak one liners. Just because you can’t justify it or can’t afford it, anyone that can and would are insane fools blinded by hype. I am beyond happy Josh Donaldson is in this checklist (not a mediocre player). Obviously if you only shoot for a Judge, Trout, Bryant, Harper…..etc you will unfortunately pay WAY above and beyond. With that said you can pick up a sick card from a legit “star” for $100-200. Not the worse thing in the world to add to your collection. 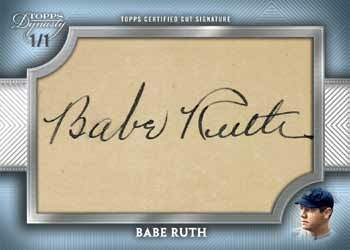 If that’s still too much then you always have the Luminaries, National Treasures, Five Star, Topps Tier One….etc. Checklists will always not impress everyone. Player images maybe used from card set to card set and patch relics come from wherever. With that said all and all I think they are great. Images are crystal clear, cardstock is quality, low numbers, hard signed, multi color patches, bit of info on the back of card and encased. Pretty much everything one would look for in a card (other than year by year stats or whatever else) Complaining about the price is old. If these go beyond your sensibility then move on. My complaint isnt about the names in the checklist, not about the design, not about the price. My complaint is this and it applies to most high end products. How can you put out 5 of a card, same color, same layout slightly different patch, and call it a 1/1, when at the same time you put out a to 5, or to 10 card the same way. Go on eBay right now and you’ll find 2 1/1 ichiro mlb logo patch autos with the only difference being the color of the patch. I do agree Andrew, yeah the lack of overall variation would be my one of my only complaints. I always get frustrated when I’m looking around for cards and find that the patch choices, colors, designs, photos used……etc aren’t unique and varied enough. Especially if your looking to get a true 1/1 or a /5 and paying what your paying, I want to be like “Wow, now that is awesome” You want to truly feel like you’ve got something special. The patch relics in high end cards is honestly one of my things too. 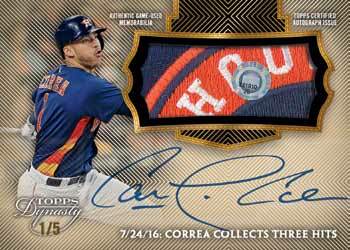 I’m not sure if the card companies are given an entire jersey to cut cards patches from or what. If they do, I would spend more time and effort in choosing more unique sections. Unfortunately, it seems card companies know that all they really need to do is press that 1/1 or 1 of 1 into the card and that’s all it takes to sell to the highest bidder. Ok is it just me or are there so many more cards with sick patches in this 2017 set than last year? Whats the point of chasing a sick patch, when they are all sick. Also, there is a 1/1 trout with an authentic patch along with MLB holo that tells you that patch is from a March 13th spring training game, common now spring training???. Not to mention there is no significance behind that game for Trout either. Brad…you can’t pick up a “legit star for $100-200”!!! The price tag is $380 per card. So bashing the person before for complaining about price when you’re too cheap to buy a box and only troll for those who are instantly losing $200 so you can buy the $100 “legit star” is just proving their point. You just let someone else pay the $385 and poach from the lack of value Topps puts in a $400 box for a single card. Go ahead and bash away; I stand by my criticisms. Other Topps products offer much more value (and cards per pack) for a fifth the price of this one card gimmickry. For example, earlier this year I pulled a HUGE, and I mean, HUGE MLB Logo Man Wrist Band Patch Book Auto Benintendi 1/1 from Inception earlier this year. No Dynasty card of a current player can match it. The patch is 3 inches by 2 inches. I paid $85 for the box. Christopher… Poaching and Trolling I would say is a bit over the top to describe what you assume I’m doing. Also as far as me bashing ones who complain about the price is in response to them bashing people who would have to be “certified insane” or “bored out of there mind” to be such a fool to purchase a dynasty or any other product THEY find not at all worth it. I agree if you take a chance on trying to catch that big fish and buy a box, only to receive a card that you will have to flip on eBay for a fraction of the price, yes that is rough. I am personally a huge Josh Donaldson fan and was excited he was in this years checklist. It was an automatic I was going to get one of him regardless. So I happen to find a seller who had a really nice 1/5 with a unique enough patch section, signature…..etc and I bought it. He had it for sale for $75. I was shocked and jumped right on it. It made my day. I guess I technically “trolled” around for the right one at the right time with an incredible price, but hey that’s what it was listed for. Now whoever originally paid for the box (maybe a live box break) situation, yes of course $385 or so to $75 is a major loss. Confirming your overall point about box price VS card value. My point was just that we all know they are pricey just like many other products. It just comes down to what roll you want to play in the mix of it all. Anyone who has ever bought a single player card at a great price, has taken advantage of the original box buyer. Chris….now that is extremely cool to get that Benintendi!! You had to buy at least a few boxes to happen to score that. Say 4 boxes at $85 = $340 give or take. Now your spending the money right back up there with the “certified insane” people who are “boerd out of their minds”. Buying box after box to get that one you can sell on eBay for hundreds of dollars is six one way / half a dozen the other on the entire topic. We are all in the same boat in our own ways. The common theme is what we do with our money in the hobby, choice, ultimate goals…..etc. The thrill of deciding to buy 1 box and take a chance is exciting, like Willy Wonka and the golden ticket. It just comes down to what captures you, what your budget is and your overall position as a collector. I’m more irritated not at the card mfg price points. I get more irritated when I see individuals trying to retire off of a low number, auto Trout, Bryant, Judge…..etc. But there again who am I to put down someone who wants to see what they can get for something.